I promised myself I’d take more pictures. During a visit to my parents’ today, I did. 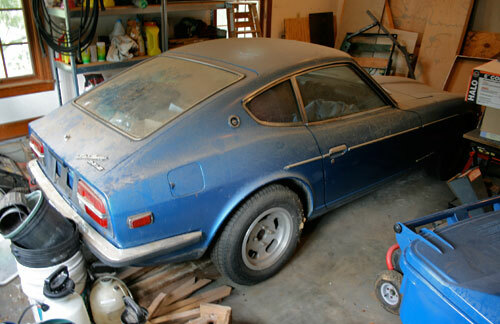 Behold, my project car, a 1972 Datsun 240Z. My dad bought it new in ’72, and gave me the keys as a college graduation present. As outlined in my previous post, it has issues, some significant, but notwithstanding those I’m eager to dig into the restoration. It hasn’t moved under its own power since March 11, 2004. That was the date of the minor engine fire and subsequent operation without oil pressure for several minutes. Since then, it’s been parked in my parents’ garage, awaiting the day when I would have a garage of my own to transfer it to. That day has come, but its new home isn’t quite ready yet—some organization is still required. So it’s still gathering dust, 90 minutes away. 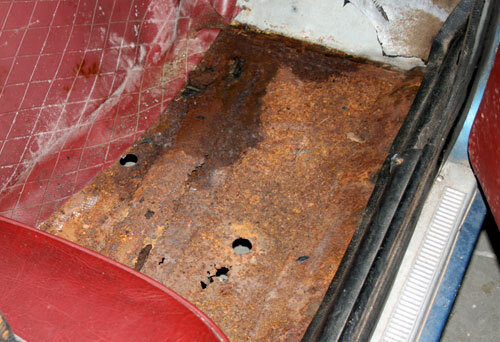 Here’s the major issue: Rust has completely consumed the passenger side floor pan and frame rail underneath. The driver’s side is fine, so why did its counterpart fare so poorly? Simple: The battery tray is smack up against the firewall on the passenger side of the car. Over the years, uncleaned battery acid ate a hole in the tray, the inner fender beneath, and the firewall itself. With all those panels swiss-cheesed, rainwater had a more-or-less direct path through the firewall and down into the floor pan, where it sat and oxidized the metal. It looks awful; I know, but again, my only hope is that I’ve seen Z-car floor pans and frame rails restored from even worse states of decay. 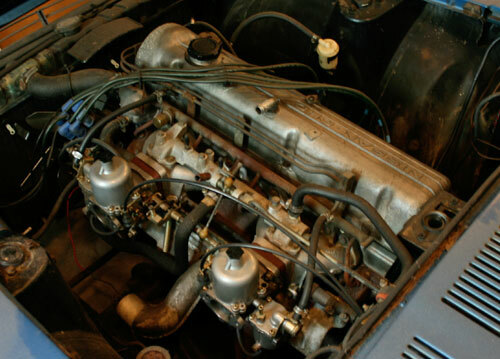 The L24, a 2.4l SOHC inline-6. Lovely engine. The orange, oval air cleaner assembly is in the trunk at the moment. You can see a few of the “modifications” I made prior to the car’s stasis: Air pump removed, air injection system capped off and other emissions garbage pulled from the balance tube, and an electric fan (stupidly) added to replace the stocker, whose fan clutch had seized. The carbs were rebuilt by ZTherapy in the late ’90s and have the ball bearing throttle shafts. Overall, the engine cleans up well. I just need to tear it down and inspect the internals as a matter of course. There’s nothing quite like getting to work on a long-anticipated project car. I’m eager to witness your progress. Well, I’m prejudiced against electric fans in general. I just like having a relatively solid, direct connection between a component which contributes significantly to the cooling ability of the radiator and the engine itself. Just seems more reliable, y’know? Even though I know it’s probably a wash. And that fan whir is annoying on hot days. Also, the particular install I did on the Z was really shoddy. Those zip-tie thingies through the fins on the radiator, and a manual switch next to the transmission tunnel in the cabin. No secure bracket mounting, thermostat control or even a shroud, for that matter. I should’ve just shelled out the $30 or however much the fan clutch was. I also own a completely original ’72, and I lean towards option 1. There aren’t many 240s left in original condition, and they drive fantastically in stock condition. Yes, moms in Toyota Sienna minivans can almost beat you at traffic lights, but the coolness factor of your Z will trump any stoplight banditry. Does your dad have the original documents from the Z’s sale? If so, color copies of the documents would make a nice display item (and conversation starter) at shows…I did the same with that stuff from my Z and people go nuts over it. My car has 92k orig.miles and is currently getting Monroe struts (closest things I could find to the origs.) and the nearly perfect complete exhaust from a ’73 from Calif. (a fortunate Craigslist find). BTW, many of the stock exhaust hanger parts are still available from Nissan. Hi Alex. I’m leaning toward keeping it pretty original too. I love the SUs and even my slotted mags, and would probably just drop in an L28 and leave it at that. I have the owner’s manual and the pouch it came in along with the business card of the salesman who sold my dad the car. I also have a maintenance log (entries peter out after a year or two) along with an original Datsun factory warranty card. Other than that…not too much. As I’ve made more progress on the car, my dad seems to remember more stuff, so I’m hopeful more trinkets will come out of the woodwork. Yours sounds great! I’ll look it up on CZC.com. I have pretty much the same car, blue with the same rust issue with my floors, firewall, inner fender and battery tray and I am hoping the rust will sandblast off of the frame rail that runs from the firewall to the headlight.Anyways I just started with this Datsun and I just wanted to hear how you tackled this issue with the inner fender area and firewall rust? Hi Dan. I haven’t tackled anything yet. Still prepping the garage, but when the time comes I’ll probably have to cut away the rusted parts and weld in solid metal, whether from a parts car or from a replacement supplier (there are many out there). Is this car still up for grabs? It’s not. My father and I are going to tackle the complete restoration together at some point in the future. do see that your comment is 6 monhts old, but I’ll answer your question.The 1974 260z was the first year for the 2+2 models. Both early carbed models and the later fuel injected ones were available as 2+2 s, although the early ones are quite rare. ﻿ Something to remember 240z=70-73(and 69 , although that’s quite rare.) 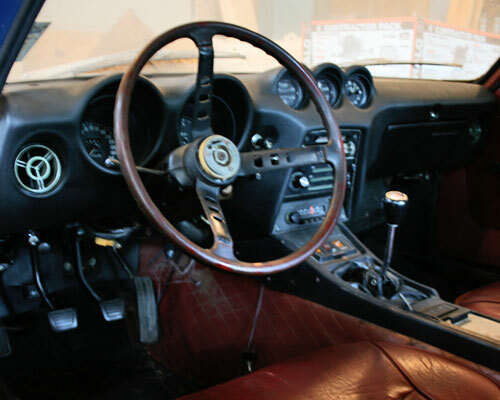 260z=1974 and 280z=75-78.